Action from FC Peterborough Reserves' 4-4 draw with Premiair (blue). Photo: David Lowndes. Peterborough Sports Reserves are inching their way to the Peterborough Premier Division title. A 1-0 win over Deeping Rangers Reserves on Saturday (April 29) made it seven wins in a row and five clean sheets in a row for Andrew Bradley’s boys. Action from FC Peterborough Reserves and Premiair in Division Four of the Peterborough League. Sports go into the final four games with a four-point lead over Pinchbeck United who maintained their challenge with a 6-0 win over Leverington which featured a hat-trick for Tyler Wright. Netherton United are three points further back after demolishing Uppingham 10-0 at the Grange. Reserve-team regulars Lewis Archer and Jorge Barbosa both bagged hat-tricks as did top scorer Tom Randall. Uppingham are now likely to be relegated along with Crowland who can’t finish outside the bottom two after an 8-1 home hammering at the hands of Stamford Lions. Luke Ball continued his terrific run of form with four goals. 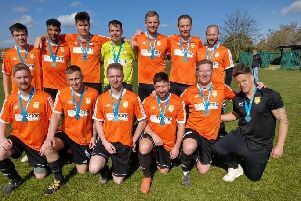 Langtoft United beat ICA Sports 2-1 thanks in part to a first goal in six matches for Scott Spearink, while Moulton Harrox edged Ketton in a seven-goal thriller. A Premiair player on the stretch in a 4-4 draw against FC Peterborough Reserves. Photo: David Lowndes. Jack Dean scored twice as AFC Stanground Sports drew 3-3 at Wisbech Town Reserves. Kieran Hamilton scored all the Wisbech goals. Ramsey moved back to the top of Division Two with a 7-0 thrashing of Leverington Reserves with Jamie Darlow and Aiden Stanford both scoring twice. Bretton North End’s 8-2 win at Uppingham means they need a point from their final two matches to formally clinch the Division Three title. Jamie Graham hit a hat-trick on Saturday. Division Four title winners Premiair were held to a 4-4 draw at FC Peterborough Reserves. Cory Rose scored twice for the champions. Crowland Town 1, Stamford Lions 8 (Ball 4, Lippett, O’Donnell, Kelly. Thomas). Netherton United 10 (Archer 3, Barbosa 3, Randall 3, Wood), Uppingham Town 0. Wisbech Town Res 3 (Hamilton 3), AFC Stanground Sports 3 (Dean 2, Staggs).